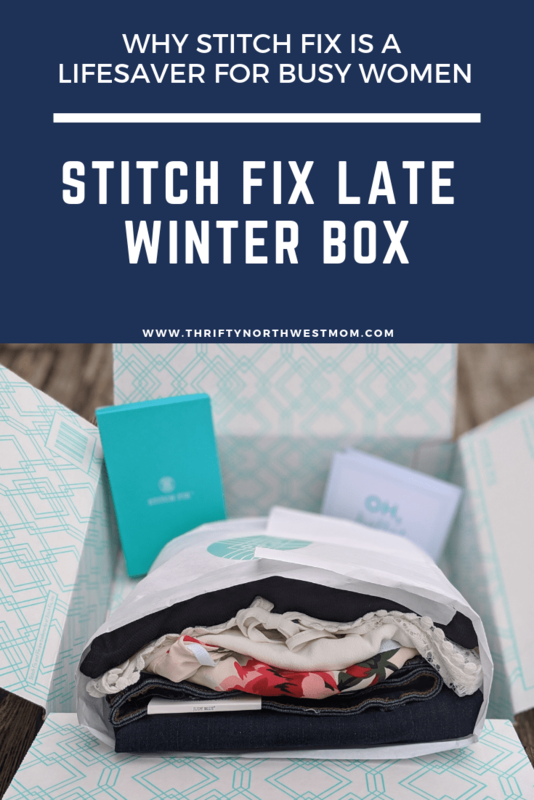 I have been using Stitch Fix for a year and try to get a box almost every month as I have been slowly adding to my wardrobe to update with more classic pieces that I was in need of for my wardrobe. I have been trying to weed out my wardrobe & let go of things I never wear anymore, to add in more classic, functional items that I know I will use for years to come. Some months I may keep several items, another month I may only keep one item or not any at all. But seeing the items that my stylist choose for me, along with her style recommendations for outfits has really broadened my perspective in the types of clothes I would typically choose. It has gotten me out of my comfort zone, which I have really appreciated. I have found styles that I would not have chosen for myself, but now I find really flattering. So I am thankful for all of the boxes I’ve received. I really do feel like the stylists learn what your style is after you have ordered several boxes from them & they will work to find the items I request or what I tell them that I really like and also items to stay away from. If you are in a busy season of life like I am, you may find it valuable to have someone do all the shopping for you – even online shopping can take me a long time to sift thru items so it’s so nice to have someone do the work for me. If you’re new to Stitch Fix, it’s a personal shopping service where you will have 5 curated items chosen by a personal stylist based on your likes & dislikes sent to you by mail, directly to your home. These items can be clothes, shoes & jewelry for you to try on in the comfort of your home so you can shop from home without doing any work. I have been loving having a stylist who does all the work for me & knows what items might be a fit based on my style & size preferences. It has been a big time-saver for me during a very busy season when I just haven’t had much time to shop for myself, either in stores or online. 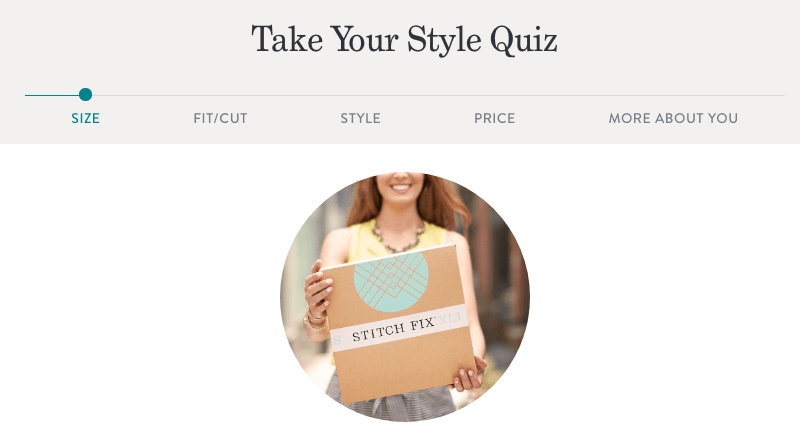 There is a styling fee of $20 for when you order a box from Stitch Fix. However, if you keep any items, that $20 will go towards the cost of the item(s). If you decide you don’t like any of the items, you can send them all back in the postage paid envelope and only pay the $20 styling fee! But if you decide to keep even just one item, that $20 styling fee will go towards the cost of that item, so you are only paying if you end up sending everything back. So far, out of all but 1 or 2 of my boxes, I have kept at least 1 item, so my $20 styling fee goes towards that item, so I am not paying any money for this service, so it’s a win-win for me. The prices can be higher, so that’s why I have not always purchased the items, but I like seeing the items they pick for me, even if I don’t purchase, as it gives me ideas of what looks I want to try out for myself as they may send items that I wouldn’t normally try on in the stores. Review the items in your box & try them on, deciding what you will keep or if you will send any back. They will say you have 3 items to try on your items & then send it back. But I just recently realized that you can have up to 2 weeks, you just need to go into your account & select that timeframe in your account. You can keep one, two or three items, etc & then send any items back that you don’t want. You will have a postage paid Priority Mail envelope to use & all you have to do is drop your bag at the Post Office mailbox within that 3 day timeframe. If you keep even one item, your $20 styling fee will be applied to your purchase of that item(s). Discount for buying ALL of the items – If you choose to keep all the items, you will get an extra 25% off the entire box. This works out to an awesome savings on high quality items. If you only have 1 item you don’t like, it may be more worth it to keep the whole box for the discount & then maybe try to sell or swap with someone else for that item you didn’t want. Fill out the Box Feedback Form online at Stitch Fix – regardless of whether you keep all the items or return all the items or some of the items, make sure to fill out the Feedback form & checkout before you send back any items from your box. This is where you can have your $20 Styling fee applied to your order (if you keep any items). This is really important to provide the feedback for each item about what you liked & didn’t like to provide that information for your style profile for future Stitch Fix boxes. Here’s my honest review of my late winter box. I ended up keeping two items from this box and am so excited about my new jeans as I have worn them this week already & they are the most comfortable pair of jeans I now own! 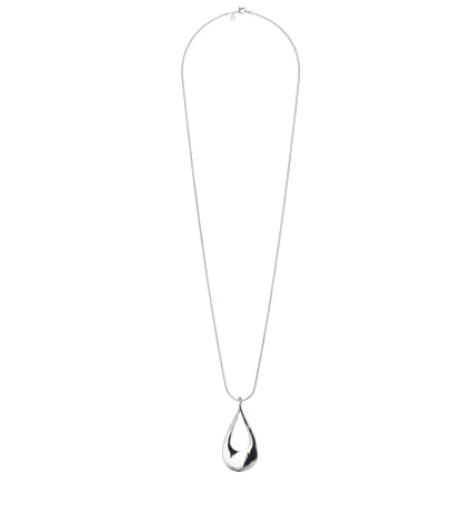 And the necklace is going to be such a classic, versatile piece that I absolutely needed for my wardrobe. These jeans are seriously one of the most comfortable jeans I have worn – they are the skinny style which is what I prefer and oh my goodness, the comfort level is so nice. 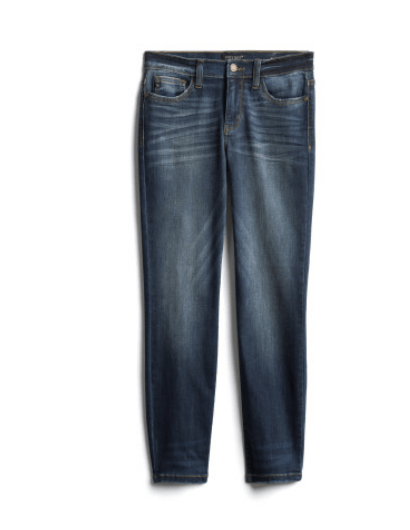 I definitely purchased this item from Stitch Fix as I felt it was a very reasonable price for high quality jeans & I loved the style & the fit! The jeans are stylish & can definitely be worn more casual with a sweater & sneakers or dress it up with a nice jacket & flats. This is a fun, spring top in the kimono style that seems all the rage right now. 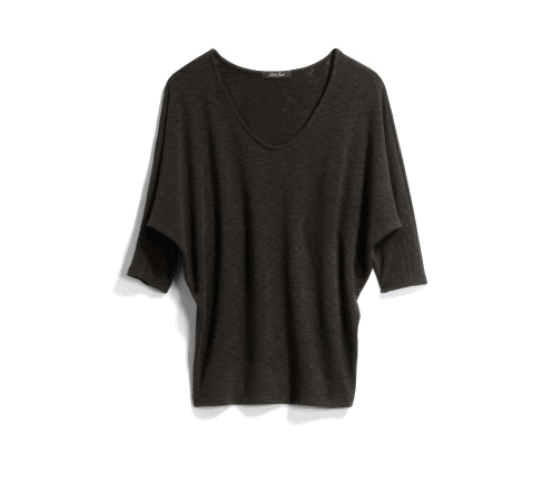 It was very light & a great layering top – they showed it paired with jeans & a black tank top & flats for a casual look. Or add it to a spring or summer dress & heels for a dressier look for spring & summer. I didn’t keep this top just as it just wasn’t . my style as much with the off-white color, although I love the color pops with the bold flowers. Ok I seriously loved this top! So comfortable & the fit is so flattering for any size, especially as the fit is tapered at the waist which I found fit so well. And the top is so soft & just flows so well. The reason I did not end up getting this top is that I already have several black tops (if it had been a different color, I definitely might have reconsidered as I’m seeing some different options on Pinterest, so I’m going to have to investigate some more). I just loved how it fit so much, but with the higher price point, it just wasn’t something I needed for my wardrobe in this color. 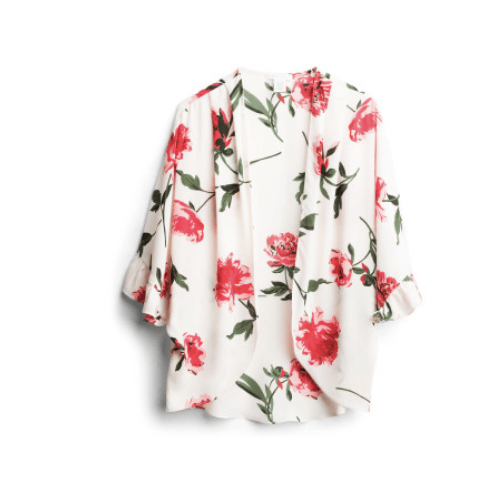 But, seriously, if you’re looking for a cozy, comfortable, super versatile top, consider asking for this top in your next Stitch Fix top – I’ve seen it pop up in different boxes & it is a top that will work for so many women! 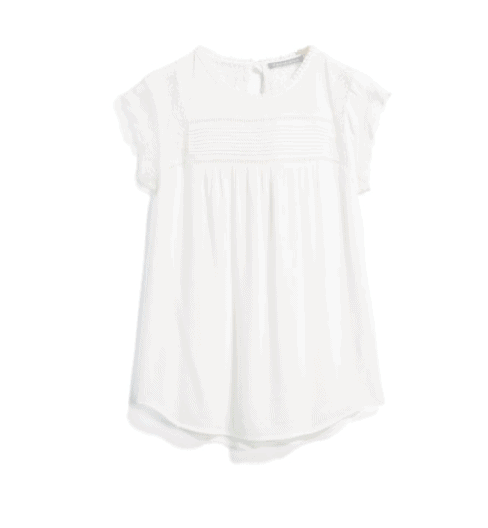 This is such a cute top to add to your wardrobe essentials for spring & summer. I love the lace detailing on the front & the sweet sleeves. Definitely feels like a romantic, spring-like top to pair with a cozy cardigan if it’s not quite warm enough. You can totally use this blouse to wear casual with jeans or dress it up with nicer pants or a pencil skirt. This is one that I did not end up keeping as the fit was not the best for me. This necklace is such a versatile piece – I tried it on with all of the different outfits & it looked so cute and is a great classic piece to add to your jewelry collection. I snagged this necklace because I have really been needing a classic, long, silver necklace and this was the perfect length & it feels like great quality. And it pairs so well with so many tops & dresses, so I thought it would be a piece I would get a lot of wear from, so I added it to my small jewelry collection. 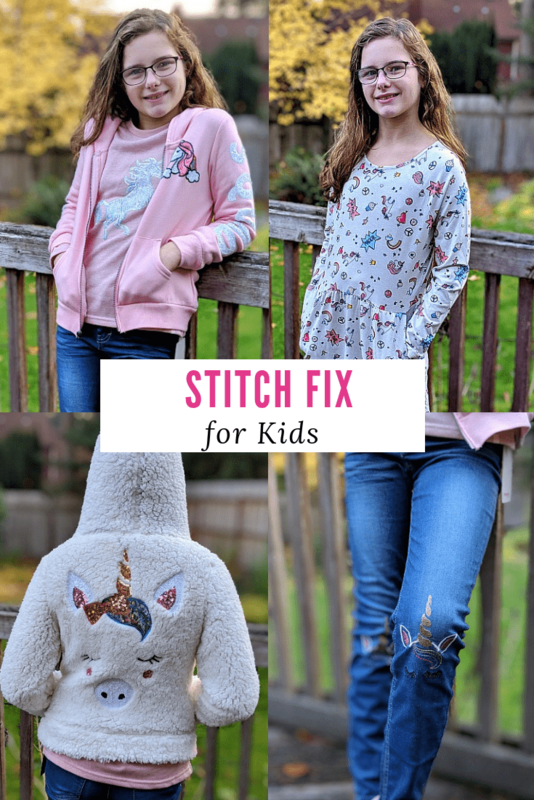 As you can see, my Stitch Fix stylist definitely found some great transition pieces into Spring for me! I was able to add to classic items to my wardrobe which I was absolutely needing (I’ve only had 2 pairs of jeans that I really like wearing right now, so glad to get a pair that are even more comfortable than the ones I have) & which fit well. And best of all, I don’t have to spend time going from store to store or searching thru pages & pages of online stores to find items that I will love! Love getting style advice from the Stitch Fix stylists to help me put together the outfits, too! What have you been enjoying with your Stitch Fix boxes? The Emory Park kimono is so pretty! Perfect for spring!